Who was St. Catherine of Siena? With so many challenging issues facing us today, it is tempting to succumb to a mood of darkness and sadness, yet Pope Francis calls us to “Live the Joy of the Gospel”. Just what is Joy, however? It is something more than just putting on a smile. During these days, we will see that Joy is something deep within us, that is, if we have truly embraced Jesus’ call to discipleship. Fr. 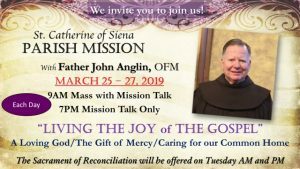 John Anglin, OFM, was born and raised in Boston, Massachusetts, where he entered the Franciscan Friars after graduating from high school. He was ordained in 1971, and obtained a Master’s Degree in Religious Education from the Catholic University of America in 1974. In 1992, Fr. John received a Certificate in Homiletics from the Aquinas Institute in St Louis. Since Ordination, Fr. John has served in various ministries including High School teaching, Parish Ministry, the Formation of Candidates to the Franciscan friars, Marriage Encounter and two years as a missionary in Bolivia. He has preached missions since joining the Franciscan Friars Ministry of the Word. Fr. John has conducted more than 500 Parish Missions and presented many Retreats for priests and religious. He has also published two books: The Wandering Friar, and Following Jesus in the Footsteps of St. Francis. Both books are published by Lantern Books of Brooklyn, New York. The first book paints a picture of the Church through the eyes of the many people and places that Fr. John has served in over the years. The second book is a guide to Franciscan Spirituality for everyone. Fr. John speaks Spanish, as well as, Italian. Some of his interests include bicycle riding and watching movies. He is an avid follower of Boston sports teams.